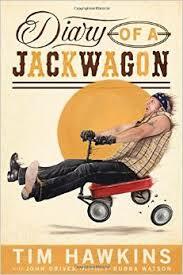 Just what is a Jackwagon, you may be asking yourself? As comedian Tim Hawkins points out on the back cover of his book Diary of a Jackwagon, it's an old term referring to military vehicles that were repaired with spare parts and were therefore unreliable. He uses the term to refer to himself, as someone who is lacking in achievement and who frequently messes up. The book is a collection of "comedy journal" entries that Hawkins has kept over his 20 year career as an entertainer. He offers his humorous observations on topics such as marriage, homeschooling (which he and his wife participate in), aging and society. Each chapter ends with some "Tweet Thoughts" -- Twitter postings he plans to unleash at some point. The observations are pretty funny and he seems like a down-to-earth and self-effacing kind of guy. However, the material does seem to get slightly repetitive (his wife is great and he doesn't deserve her, things are different from how he grew up, he's kind of a doofus, etc.). He also puts a Christian spin on many topics. There are tons and tons of appreciative quotes from a variety of people on the back of the book and covering the first 4 pages (overkill much?). Still, it's an enjoyable enough read for those who like their comedy topics clean and kind!